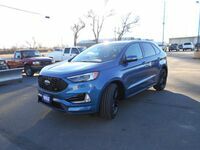 The 2018 Ford Edge in Ogallala NE stands out in the cluttered and competitive crossover segment. 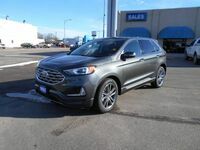 This impressive vehicle delivers sporty performance paired with the practicality and versatility that has drawn car shoppers to the crossover segment. Three total engines will be offered on the 2018 Edge. Standard equipment includes Ford’s 2.0-liter EcoBoost four-cylinder engine. Performance numbers for this engine check in at 245 horsepower and 275 pound-feet of torque. In addition to the four-cylinder engine, the Edge will offer two V-6 engine options. The first is a 3.5-liter V-6 rated at 280 horsepower and 250 pound-feet of torque. The second is the EcoBoost 2.7-liter V-6 engine rated at 315 horsepower and 350 pound-feet of torque. 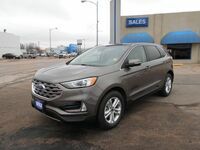 When properly equipped, the 2018 Ford Edge is able to earn up to 21 miles per gallon in the city and 29 miles per gallon on the highways. Car shoppers considering the 2018 Ford Edge will have four trim levels to choose from. The Edge is offered in SE, SEL, Titanium and Sport models. Each trim level offers a different collection of comfort, safety and technology features. Comfort and Technology Features:Bluetooth and USB connectivity, auto-dimming rearview mirror, dual-zone automatic climate control, leather-wrapped steering wheel, satellite radio, leather upholstery, heated front seats, SYNC 3 infotainment system, Apple CarPlay and Android Auto, hands-free liftgate, 12-speaker Sony sound system, HD radio, panoramic sunroof. Safety and Driver Assistance Features: Rearview camera, rear parking sensors, rear-seat entertainment system, forward collision warning, lane-departure warning and intervention system, blind-spot monitoring, automatic wipers, automated parking feature and a 180-degree front camera. The 2018 Edge Sport trim level adds multiple performance-oriented features. These include sport-tuned suspension, variable-ration steering along with special interior trim and upholstery.